Getting off the X, what does it mean? The x is the point of attack or where the attacker will be focusing their attacks. Chris demonstrates at :20 seconds that he is standing on the X, as he would be the intended victim of the bad guy. The goal of the shooter is to distract the bad guy from the X and make it into a mobile X. The point of this is to force the attacker to change their point of attack in a short amount of time. Doing so will reduce their change of landing hits. You gain the edge of making your attacker adapt to your movements while you are still in full control. 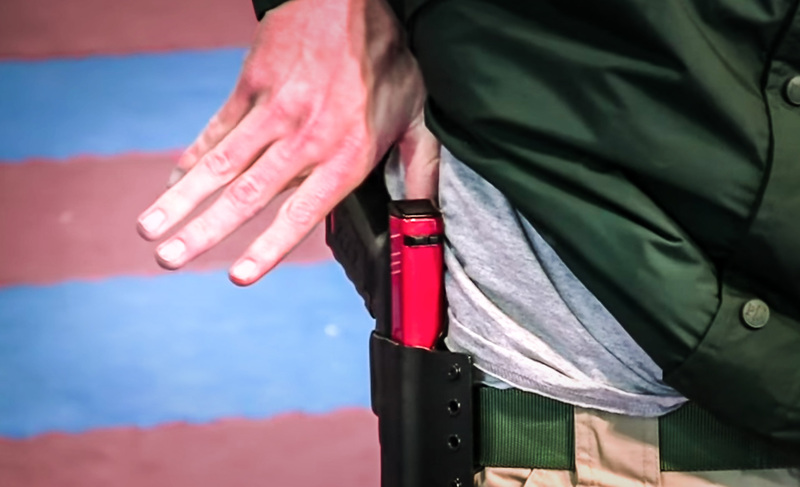 As Chris shows at the :45 second mark, if you are standing straight towards your attacker, wild-west showdown style, your best chance for survival is to move laterally, left or right. When the bad guy attacks, jump off line, draw your weapon, extend, prep, press, and repeat as necessary. While the difficulty doesn’t change, it is important to practice moving to both sides. Note how Chris plants his foot at 1:20. In the same motion he sweeps, draws, and engages the target. Chris maintains clear control of the weapon which is apparent by the green dots on target. If you are training and your shots appear as dashes, slow down and focus on the fundamentals. Speed up as you become comfortable incorporating movement into your training. Learning how to do this fluidly may just save your life.